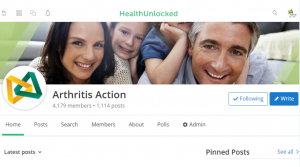 Arthritis Action has a lively community of over 4,000 members, on health-specific social network Health Unlocked. The platform offers a safe environment for people to share their experiences, support each other, and discuss aspects of living with arthritis. We welcome discussions on all types of arthritis including rheumatoid, psoriatic, osteoarthritis and gout, the effects of diet and exercise or the latest research. Health Unlocked is social platform for people to connect with others based on similar health experiences. The peer-to-peer support network helps make a difference in the lives of those living with arthritis by offering a community accessible from the comfort of your own home or on the go. Our mission is to help people manage their arthritis, to live a more active life with less pain and, if possible, reduce their need for medical interventions.